How many quarts / liters of engine oil is needed for an oil change including replacement of oil filter for a Dacia Duster. Dacia Duster 1.5 dCi, engine oil capacity in quarts / liters. Dacia Duster with engine 1.5 l, it is a cargo cars. Dacia Duster engine code: K9K 796, K9K 894. Dacia Duster engine oil capacity liters: 4.5 l.
Dacia Duster manual gearbox oil capacity: 2.5 l.
Dacia Duster automatic gearbox oil capacity. 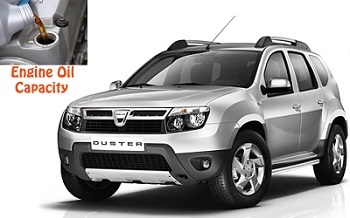 Dacia Duster recommended engine oil: A.Z. Meist MT-7D 5w-40, Castrol 10w-40 Magnatec Diesel, Castrol 5w-40 Magnatec Diesel, Liqyu Moly Leichtlauf Diesel 10w-40, Diesel, Mobil 1 Super 2000 X1 Diesel 10w-40, Mobil 1 Super 3000 XE Diesel 5w-30. Dacia Duster 1.6 16V, engine oil capacity in quarts / liters. Dacia Duster with engine 1.6 l, it is a cargo cars. Dacia Duster engine code: K4M 690, K4M 606. Dacia Duster engine oil capacity liters: 4.8 l.
Dacia Duster manual gearbox oil capacity: 2.0 – 2.5 l.
Dacia Duster recommended engine oil: A.Z. Meis MT 7 5w-40, Castrol 5w-40 Magnatec, Mobil 1 Super 2000, Mobil 1 Super 3000, Liqyu Moly Toptec 4100 5w-40, Liqyu Moly Toptec 4200 5w-30. All information about engine oil capacity or gear box oil capacity is taken from Dacia Duster owners manual. Yesterday i got my car service from outside gerage. they changed engine oil filter and engine oil, they changed oil filter size also.. now it is bigger than exixting. will it effect on enginer as now engine oil filter is bigger than existing?? Hello Riyaz, I suppose you have a Dacia Duster, can you tell me what oil filter you use, a code for this auto part, the name of the manufacturer ? I changed engine oil and engine oil filter but it is lowr than maximam. I used castrol oil.I want to know that how much oil engine is needed? 4.5 lit or 6 lit? Hello Nahid, what engine do you have ? From what year it is your Duster? And what is the power of your motor in hp or kw ? How much engine oil and engine oil filter is needed ? 4.5 lit or 6 lit? Please answer to above questions, and I will try to help you ! Where are you from? In Europe the biggest engine is 1.6 gasooline and 1.5 diesel. I think it is the same as in Europe for Dacia Duster. For engine 1.6 16V and 1.6 4×4 the engine oil volume is 4.5 liters. For engine 1.6 16V LPG after year 2015 is 4.2 liters and for 1.6 16V Bi-Fuel made after year 2010 is 4.8 liters. For engine 1.6 16V Hi-Flex the engine oil volume is 4.8 liters.